If you are still confused on what type of roof would be better for your property, then you should first understand your roofing needs. If you are like those homeowners who are struggling for more space at home, then flat roofs may likely be the best roofing type for you. To further give you an idea of the benefits of flat roofs, here are some of the commonly observed advantages of flat roofs for your home or commercial building. 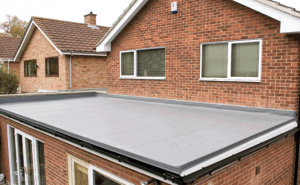 You may be wondering now how flat roofs could add more space to your property, right? Well, this type of roofing has been employed by most homeowners who are in need of more space because they can easily convert their roof into a rooftop deck to entertain guests. Similarly, a flat roof has also been utilized by most homeowners as a storage area for less used items. On the same manner, the flat roof also provides a spot for installation of heavy equipment such as antennas and AC vents and exhausts. Here at Proven Contracting, we find it easier to work on the rooftop when a home or any property has flat roofs. With a flat roof, roofing maintenance will be easier as it provides a flat surface for our team of experts. As a homeowner, you yourself can easily access the rooftop and check for issues or simply relax on your rooftop. Perhaps the number one reason why property owners turn to flat roofs nowadays is that of its affordability. Yes, as compared to the sloped or pitched roofs, flat roofs will not likely require shingles and additional decorative materials. Hence, reducing the construction expenses to a significant level. Similarly, as mentioned above, since flat roof provides easy access, repairing it will less likely to be expensive. Therefore, providing you additional savings. One avenue through which you may be able to save by using flat roofs is its durability and lifespan. Unlike other roofing types, the material composition of flat roofs is quite robust. Its composition is easy to maintain and it is structured with tar and gravel for extended usable lifespan. As per industry evaluation, a flat roof may last up to 40 to 50 years, Therefore, guaranteeing you a long-term savings. Unlike the sloped or A-shaped roofs commonly used by most property owners, a flat roof offers less wind resistance because of its flat and symmetric surface. This feature matters because during storms that bring forth strong winds, shingles and tiles of an angled roof structure will directly be ravaged by the strong wind. Hence, resulting to damaged shingles or missing ones. Those are some of the reasons why flat roof has been increasingly becoming popular among homeowners and business owners alike. It offers space, durability, extended lifespan, and affordability. As a leading roofing contractor in New Jersey, you can count on Proven Contracting to assist you with your plans of having flat roofs for your property. Simply contact us at any one of our locations in Bridgewater, Randolph and Long Valley.